The empirical illustration of the constrained balancing framework begins with the incentive structure Germany and the United Kingdom faced at the end of the Cold War. As regards the distribution of power, the end of bipolarity constituted an unfavorable shift for both states as it left US power unchecked and made the United States free to implement policies at odds with British and German interests. Especially in the military realm both states faced strong incentives to increase their autonomy and capabilities. Yet these incentives were countered by considerable constraints emanating from the institutional environment of both states. 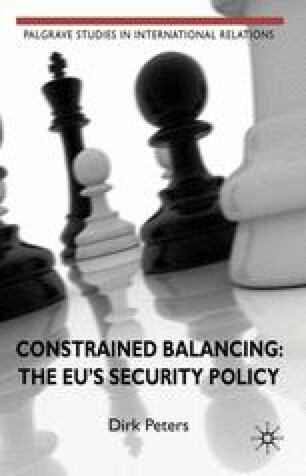 The strength of these constraints differed, with Britain facing significantly stronger restrictions than Germany. Both states were embedded in NATO and thus were subject to comparable incentives not to temper with NATO institutions. In addition to NATO, however, the United Kingdom had very strong bilateral institutions with the United States which further reinforced the constraints on its balancing incentives. In contrast, Germany had not developed particularly strong bilateral institutions with the United States. Rather it possessed a close institutionalized security relationship with France which reinforced, rather than constrained, its balancing incentives.